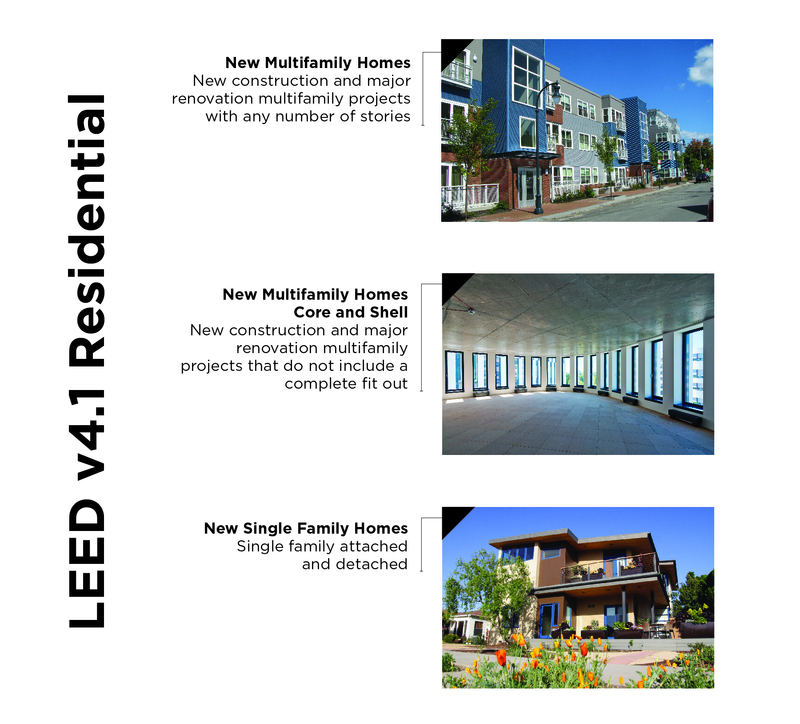 LEED v4.1 Residential: New Multifamily Homes Core and Shell. Multifamily projects around the world have often had dilemmas when it comes to LEED. Should they use the requirements for midrise, highrise or new construction? Which rating system is the best choice for their project? The updated rating system is designed to address this and make the decision to implement LEED much easier for the residential market. USGBC believes that all buildings should be green buildings—especially homes—because LEED-certified homes are built to be healthier, more efficient and more cost-effective. LEED-certified homes enhance the health and well-being of their occupants by providing clean indoor air and incorporating safe building materials to ensure comfort and safety. They are designed to save critical resources and use less energy and water, and therefore, they can lower utility bills each month and provide other financial benefits. LEED v4.1 Residential is designed to revitalize our approach to the housing market. Options have also been added to existing LEED credits that lower both hard and soft costs to achieve certification. And recognizing the unique circumstances of international projects, LEED v4.1 Residential is also now more applicable this key market which continue to grow. We have further localized the rating system to meet the unique needs of different markets. For example, the rating system now applies to homes with various ventilation strategies (mechanical or natural). With all these changes, LEED v4.1 Residential is something new but familiar – and simple, straightforward and more inclusive. LEED v4.1 Residential: New Single Family Homes is now available for registration in LEED Online. LEED v4.1 Residential: New Multifamily Homes is now available for registration in LEED Online for all countries except the United States and Canada. Projects in the United States and Canada can continue to use the LEED v4 rating systems available to residential projects and substitute credits from the LEED v4.1 Residential rating systems to benefit from the rating system’s new features. Learn more. LEED v4.1 Residential: New Multifamily Homes Core and Shell is now available for registration in LEED Online for all countries except the United States and Canada. Projects in United States and Canada can substitute credits from the LEED v4.1 Residential rating systems to benefit from the rating systems’ new features. Learn more.